The Pro Max low profile baitcaster from Abu Garcia is one of the most popular baitcasters on the market. The reason for this is the excellent high-speed performance of the reel accompanied with an affordable price tag. You’ll definitely find it to be one of the best spinning reels on the market right now. Regardless of your level of experience with a baitcaster, the Pro Max is going to make a fine addition to your outfit. In this unbiased review, we will take a look at some of the main features of the Pro Max and discuss how these features and other characteristics translate to the reel’s performance on the water. If you are looking for a slightly stripped down version, go ahead and check out our Abu Garcia SilverMax review too. The frame of the Pro Max is made from a single piece of quality graphite as are the side plates. Abu Garcia did a fantastic job in fitting the graphite pieces to together as the transition points are seamless, and this greatly helps in keeping the gears aligned when dishing out cranking power. The entire reel is not graphite, the reel handle and spool are double anodized aluminum, and the spool is also ported to cut down on excess weight. The reel has a recessed foot which makes it sit lower on the rod, and aids in it’s overall balance to the rod making it seem like the rod and reel are once piece of equipment. This is a lightweight and compact fishing reel that sits low on the rod and fits naturally in your palm. Fatigue is not an issue with this reel, and that makes a big difference since it is designed for high-speed retrievals with lots of casts. The bent double arm handle and star drag sit close to the reel and are easy to manipulate, and the paddleboat grips give you a fantastic hold in less than ideal conditions. The brake adjustment is located externally on the opposite side plate so quick adjustments can be made for the cast. The thumb clutch works perfectly and we have not had any issue with it becoming stuck. Overall, all of the features and adjustment points of this reel are easy to use and feel like they are right at your fingertips. The Pro Max offers incredible speed with a gear ratio of 7.1:1 and a line retrieval rate 29” per turn of the handle. This is a great option for working high speed retrieves with buzz and spinnerbaits or searching large chunks of water with a Carolina rig. Not only is the reel incredibly fast, but the smoothness of the retrieve never falters. The Pro Max used seven high-quality stainless steel ball bearings that make this reel pull line back in with minimal effort on your part. The ceramic line guide on the reel doesn’t seem to negatively impact casting, and it does a good job of distributing line evenly back on the spool. And this reel holds a tremendous amount of line at almost 150 yards of 30lb test braid. This smoothness in the retrieve is maintained even under some pressure with the Duragear brass gears that stay aligned. While it is not going to be as smooth as simply reeling in your lure, the difference is not all that noticeable. 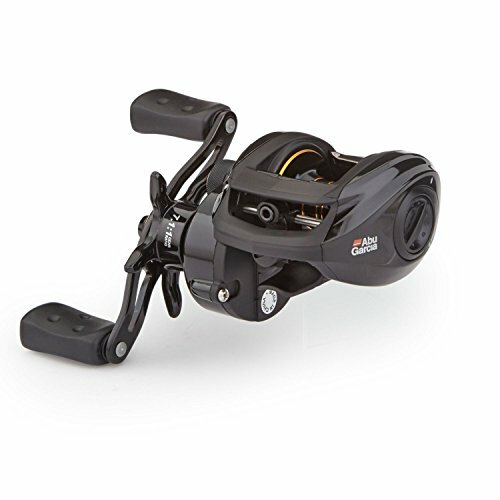 The Pro Max has decent cranking power though as with most reels, the high gear ratio means a decrease in the amount of power it is able to generate. While it can be used with more finesse techniques and deeper diving lures, it’s not what it is best suited for. The Duragear brass gears that are used in this reel are excellent though, and this reel has no problem at generating some lifting power on medium to even larger freshwater species. The Pro Max excels in the casting department. The line lay and spool design maximizes the distance achievable with this reel. The level wind is wide enough to not inhibit the cast too much with added friction on the line. With some adjustments to the spool tension, this reel can fling a wide range of lure weights. The control you have with this reel due to its design and how it sits on the reel gives you a lot of accuracy in shorter and more technical casts, and the thumb clutch also aids in this aspect. The Pro Max also has an excellent brake system with its magnetic MagTrax system. This brake is very sensitive to adjustments, and it provides consistent resistance to the spool throughout the entirety of the cast. With this magnetic braking system and some thumb play, backlash is greatly reduced. For reels similar to the Pro Max in size and price range, this is one of the top braking systems we have come across. The Pro Max uses the Power Disk drag system that is seen in several of Abu Garcia’s reel models. This system uses synthetic washers that can dish out 18lbs of max drag pressure, which is more than you are ever going to need with this type of reels fishing application. This is the same drag system as seen on the Silver Max, but for whatever reason, the start up inertia is much less on the high end of the range for this model. Adjustments to the drag with the star adjustment located adjacent to the handle are delicate and audible and give you play over the entirety of the drag range in fine increments. Once the drag is engaged, there is a constant pressure applied to the spool throughout the entirety of the fishes run. Often the drag pressure can get a little jumpy at the high end of the range, especially if the fish is making a lot of stop and go’s with changes in direction. The drag on the Pro Max has almost none of this play until you get the drag cranked up to the max. The Abu Garcia Pro Max has the feel and performance of a high-end low profile baitcaster without the high-end price tag. This reel has incredible casting performance and with fast retrieval performance that is perfect for a lot of freshwater applications and it has the drag to back it up. The reel overall feels fantastic in your hands, and when paired with a decent rod, the balance can’t get much better, and you have a set up that can be used for hours at a time with little fatigue. Whether you’re looking for your first baitcaster or in need of a new favorite or backup reel, the Pro Max will fill your needs without putting a dent in the bank account.